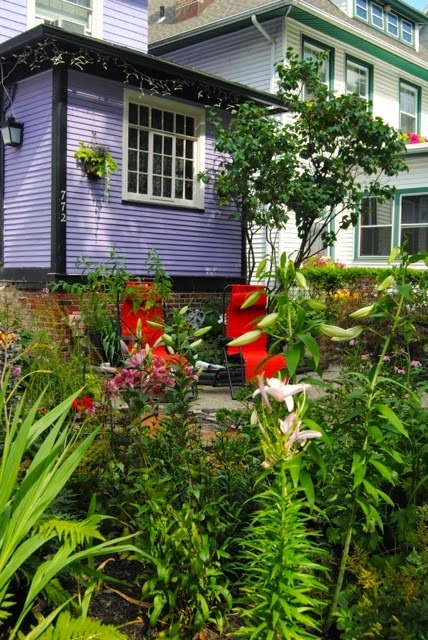 I wanted to show off the handsome Garden Walk Buffalo garden of Mark, on Richmond Avenue. I met Mark out at Italian Marble & Granite when I was there choosing the marble and granite scraps I was collecting from their dumpster for my project. Mark was there (for a fourth time, I think) collecting more marble and granite for his Garden Walk projects in his garden. The largest of his projects is seen above - two large "floating" pieces of marble smack dab in the middle of his front yard garden. 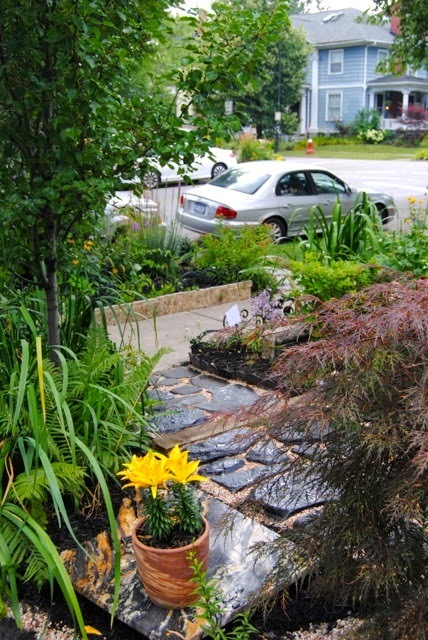 The front garden is very small, but jam-packed with plants, all perennials. An overall "theme," if you can call it that, is the color black. 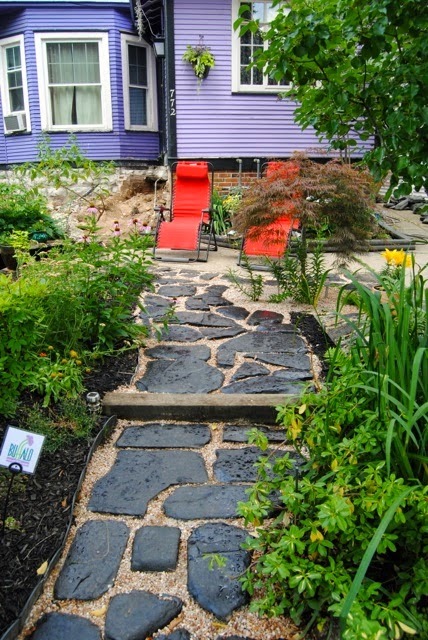 The marble has much black in it, the mulch is black, and he's even painted the stones in the walkway black. The marble pieces above are resting on blocks that are covered with black marble – giving it that look of floating – as the blocks just disappear. 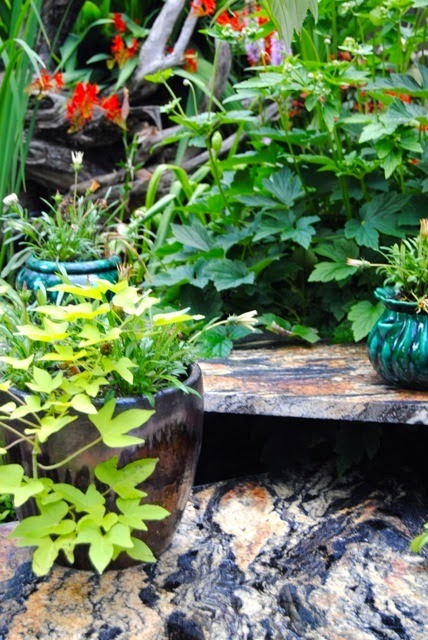 In college, in graphic design and advertising classes, I learned, and found that, color artwork (in those days, marker renderings) "pop" better against black matte board, than against white matte board And I would say the same is true in a garden. Mark's garden is very small, and there's some construction of some stairs/small porch going on right behind it, near the foundation of the house, but that didn't take away from what there was to enjoy of the garden. I'm actually looking forward to see how he integrates the stairs into what is already there. 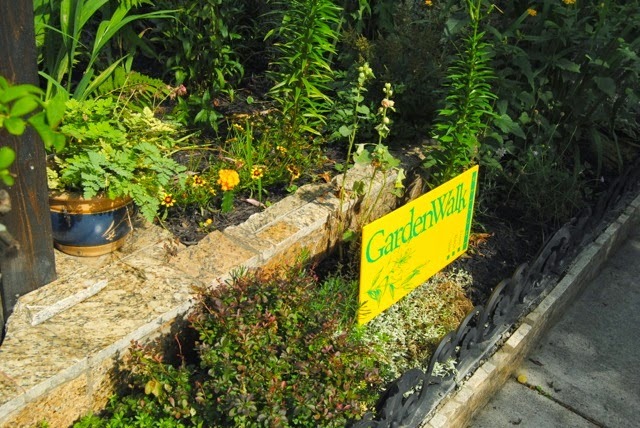 The garden is dedicated to his wife, Janet, who passed away a few years ago. There is a plaque commemorating the garden in her memory. A close-up of the marble slabs. 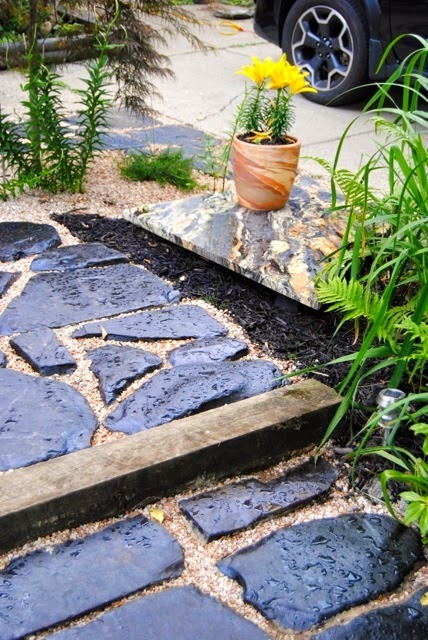 The marble slabs looked right at home with the black stone walk with stone mulch. 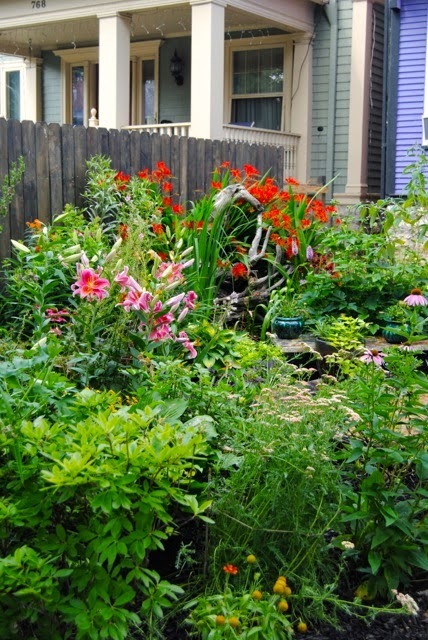 Can a garden look "manly"? I think this one does. It certainly isn't frilly. Perfect color chairs to punctuate the walkway. 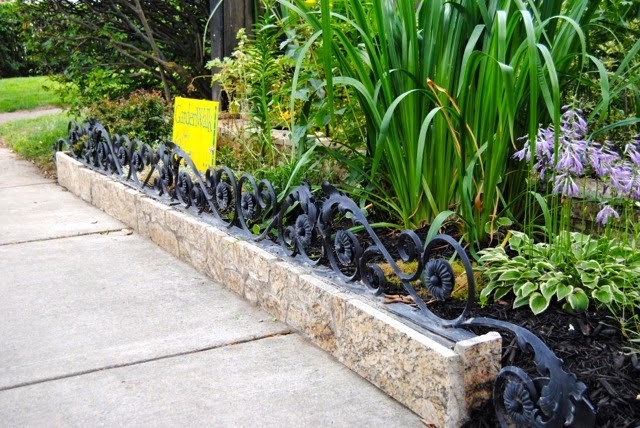 Another granite project Mark did was this low wall topped with black wrought iron grill work. 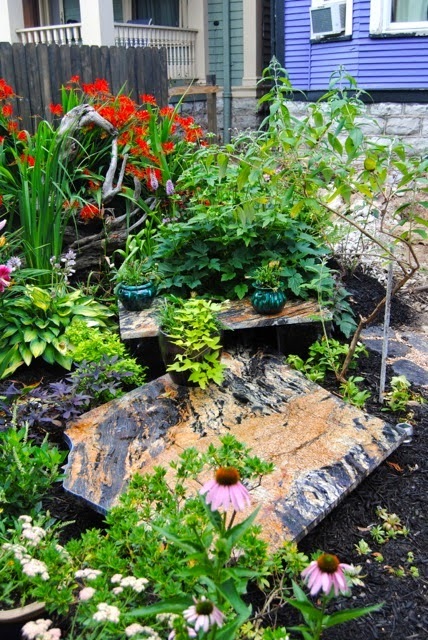 It made for a really nice finished look to the sidewalk edge of the garden. 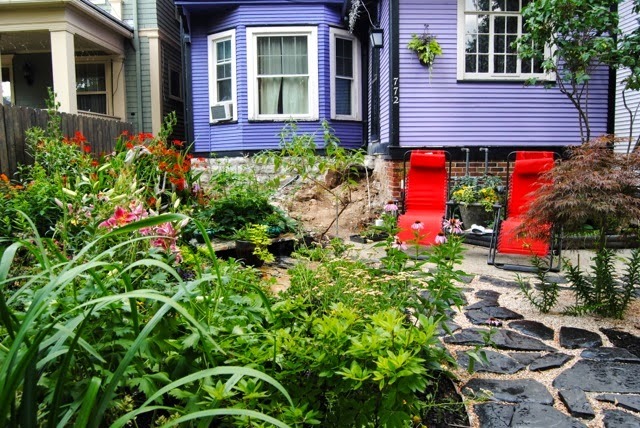 We love our grassless front yards in Buffalo. Do you think he took samples of the crocosmia in when he bought those chairs? I like his choice or strong red too in the plants and lounges. Even the house color is bold too. I like your title too, I saw a few backyard front switches on the Walk.